He's the first person in history to reach the Geographic and Magnetic North and South Poles as well as climb the highest peaks in all seven continents, the Adventurer's Grand Slam. He's an MBE & an OBE. And now he's not just David Hempleman-Adams, but Sir David Hempleman-Adams! The Knight Commander of the Victorian Order (KVCO) honour is a personal gift by the Queen and is only presented to the Royal family or those working for the Royal family. "It's an extraordinary honour. I will be forever in the HRH Duke of Edinburgh's debt," he said. Today is the 60th anniversary of the first successful ascent of Everest by Sir Edmund Hilary & Tenzing Norgay on 29 May 1953. Since then many more have conquered the world's highest peak - but only a select few have done it twice, and by both the south and treacherous north side. Moredon's David Hempleman-Adams is on that list - as well as being the first man in history to complete the Grand Slam of reaching the Geographic and Magnetic North and South Poles as well as climbing the highest peaks in all seven continents. A good day then to pay tribute to Swindon's greatest ever explorer. - "I would kill for fish & chips and a pint of Arkell's!" - had an unusual toilet problem at Everest Base Camp with Brian Blessed! Swindon-born explorer David Hempleman-Adams has always been proud of his home town. 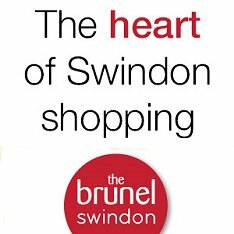 Now Swindon has even more reason than ever to be proud of him. 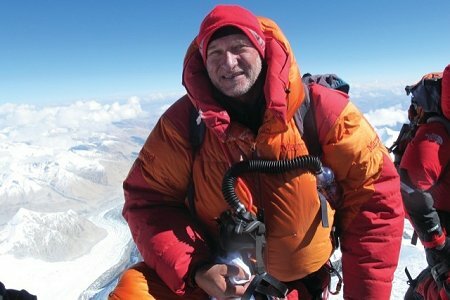 Famous as the first man in history to reach the Geographic and Magnetic North and South Poles as well as climb the highest peaks in all seven continents, David's exploits and adventures mean this Moredon-born explorer is regulary in the news and constantly breaking records many consider impossible. But while nobody has seen more of the world's most remote places, David has always been happy to follow his roots home to our area after each adventure. Though he now lives at Box, near Bath, he remains a committed Swindonian. In 1995 he said: "I've been all around the world and will probably do so again, but I will never leave Swindon. "I don't want a millionaire's lifestyle. I love Swindon and will always come back here. One thing that is certain to get me angry is people knocking the place." He was born David Hempleman in October 1956 and was brought up in a council house in Moredon. He went to Moredon Infant and then Moredon Junior School before his parents' divorce forced him into a big decision at the age of nine. The young boy had to choose whether to go with his father, who often worked abroad, or his mother, who moved to the small village of Stoney Littleton near Bath. He chose to go with his mother. She re-married, changing David's name to Adams, and it wasn't until he was 24 that he changed it again, to Hempleman-Adams. Without the move, David Hempleman-Adams may never have become an explorer at all, let alone one of history's finest. "I had been transformed from a boy from a railway town to a country lad," he recalls in his autobiography, Toughing It Out. "I loved getting dirty, working hard, and forever being in the fresh country air. My love affair with adventure followed shortly afterwards." At the age of 13, the Duke of Edinburgh Award Scheme gave him a first taste of the lifestyle that he would soon adopt. By the age of 16 he had won the gold award and had already conquered a succession of Welsh mountains. On leaving school he took business studies at college in Manchester but spent his spare time learning whatever he could about mountaineering - either through actually climbing or studying the sport. Between terms he took part in a student exchange in New York and there met Steve Vincent, who was to become a climbing companion. Incredibly, Steve too, came from Swindon and the two formed a formidable partnership. In 1979, while Steve nursed a broken leg, David visited Mount Everest for the first time. He failed to gain a place on German and Yugoslav teams but saw enough of the awesome spectacle to convince him that he had to go back. He returned to England to complete his college course and begin postgraduate studies at Bristol Polytechnic. When he wasn't studying, David was off again, climbing. With Steve Vincent he made it to the summit of Mount McKinley, Alaska, the highest point in North America, in August, 1980 (pictured, right). A year later he had climbed Kilimanjaro, Africa's highest mountain, but the challenge of scaling the heights of all seven continents was not, at that time, on the agenda. In fact, David found that climbing was no longer enough, and turned to polar trekking as a new challenge. His Geographic North Pole trip of 1983 was masterminded from Robnor, his father's epoxy resins company at South Marston. It was here that equipment was stored while David raised the £40,000 needed for the trip. That was a small budget for such a trip, but David had decided to try to be the first man to do it the unconventional way - by walking alone and unsupported. A fall more than 200 miles from his target was to leave David with two cracked ribs and the Geographic North Pole, for now, remained unconquered, but he returned almost exactly a year later to attempt to reach the Magnetic North Pole instead. This time an attack by a polar bear and a fall through the ice into freezing waters failed to prevent him reaching his goal. Then came an eight-year break from major expeditions as David joined the board of directors at Robnor, married his wife Claire and for the first time became a father, to Alicia. He returned to the world of intrepid explorers by leading the first ever team to another landmark, the Geomagnetic North Pole, in 1992. Then it was back to mountaineering and the sternest test of any climber. But attempts to join a team who were planning an attempt on Everest were put on hold as David's second daughter, Camilla, was born and then his father died, all in the space of a few days. But in August, 1993, he finally set off to try to fulfil his boyhood dream. "I would kill for fish and chips and a pint of Arkell's" he wrote during the trip and, after reaching the summit, said: "The time will live with me forever. "At precisely 11.38am on 9 October 1993, I clambered on top of Mount Everest and stood there, on the summit of the world, in disbelief... I had three minutes to myself on the snowy mound that represented one of my major goals in life." Within a year he had also been to Russia to climb Mount Elbrus, Europe's highest mountain, the fourth time he had stood on top of a continent, but making it to the other three had still not entered his mind. "I suppose once you have made it to the very top of the world, there does not seem much else to do in mountaineering," he said. The idea of making it to the 'magnificent seven' was suggested during a chance meeting with Rebecca Stephens, the first British woman to climb Everest. It was just the challenge that David needed. At Christmas, 1994, he made it to the top of Mount Vinson in Antarctica. Two months later he had also reached the summit of Mount Aconcagua, the Argentinian mountain that is South America's tallest. 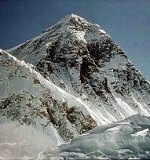 David undertook the ascent of the seventh peak in April, 1995. Carstensz Pyramid in Irian Java is Australasia's highest point and a tough rock climb. Having scaled it, David became the third Briton to complete all seven peaks. He received the MBE in the Birthday Honours and, back at home, his wife gave birth to a third daughter, Amelia, but David's thoughts were already turning to the South Pole. In the meantime, there was business to sort out and David took the decision to sell his company, now called Robnorganic Systems Ltd, to a chemicals corporation, for a reputed £6million. Now able to concentrate more on his adventures, he was, even by his own standards, about to experience a remarkable year. 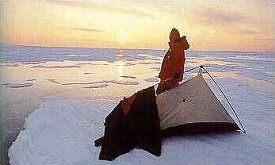 It was 1996 and before January was over he had completed an epic 680-mile solo walk to the Geographic South Pole. Within a month he had also reached the Magnetic South Pole, this time by boat, completing the trip in the only time of the year that it isn't frozen over. The hat-trick was completed in May when he led the Ultimate Challenge team to the Magnetic North Pole. The only remaining goal in the grand slam still to be reached was the Geographic North Pole and preparations began for the 496-mile walk. 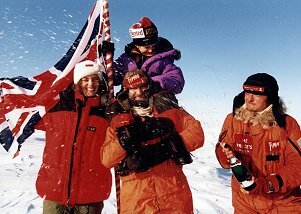 Setting off in March 1997, David and companion Rune Gjeldnes were held up when they saved the life of fellow explorer Alan Bywater who had fallen through the ice. But it was a damaged sled that finally put paid to the attempt, the pair refusing to allow another sled to be airlifted out as the trip was meant to be unsupported. The job would have to wait for 1998 before it would be completed. Even a fall through the ice - this time it was David's life that was saved, by Rune - could not prevent David Hempleman-Adams writing his name in the history books as he finally made it to the pole on 29 April, 1998, and in doing so became the first man in history to reach the Geographic and Magnetic North and South Poles as well as climb the highest peaks in all seven continents the so-called 'impossible' grand slam. Shortly after returning from his record-breaking adventure, he was awarded the OBE to add to his MBE. 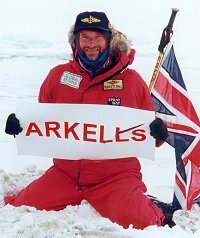 Never one to rest on his laurels, David Hempleman-Adams carved is name in history yet again seven months later when on 11 December 1998 when he became the first person to balloon over the Andes. Fittingly, he was made a freeman of the Borough of Swindon in 1999 and has since gone onto to complete a number of truly unbelievable conquests including three ballooning records - the first man to balloon solo to the North Pole in 2000; cross the Atlantic in an open wicker basketed balloon in 2003 and to break the world altitude record in a Roziere balloon in 2004, and a conventional balloon in 2007. 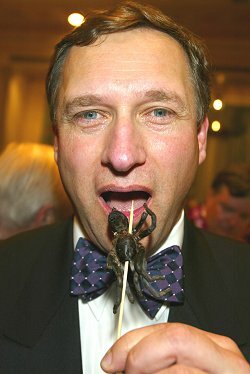 He even managed to fit in breaking the world record for the highest ever formal dinner party, when David and three collegues tucked in to a meal while sitting at a table suspended from a balloon! (see links below). 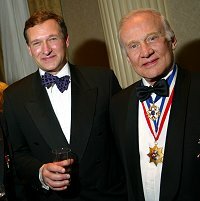 In 2004, David was recognised for his unique achievements at the prestigious Explorers Club, when astronaut Buzz Aldrin presented him with the Explorer's medal at their annual dinner in New York. It was confirmation that Britain's latest and possibly last great explorer has long since ceased to be just a local hero. Now he is a truly worldwide one. Having conquered the south side of the world's highest mountain in '93, you would have thought Everest was 'job done' for an explorer who had nothing more to prove. But when Iceland decided to sponsor an ascent on the treacherous north side of the mountain, there was only one man they wanted to lead the expedition - David Hempleman-Adams. And despite horrendous weather conditions, illness & severe altitude sickness, he and his team reached their target on 22 May 2011. After summitting at 8.10am David Hempleman-Adams alongside sherpa Nga Temba were forced to spend an unplanned extra night in the ‘death zone’ at 8,300m due to exhaustion and problems with his oxygen sets. He also lost radio contact with Advanced Base Camp, causing extreme concern to the team below. However, DHA was able to descend with three Sherpas despite winds of over 60mph! The expedition raised over £1 million for charity. As achievements go, this one was truly going to be unique - being the first man to fly a balloon SOLO over Everest. And after months of preparation and meticulous planning, everything was ready to go in September 2001. But David Hempleman-Adams feat was thwarted by the terrible 911 Twin Towers disaster in New York and the restrictions put on the airspace around Everest by the Chinese Government. DHA, then 44, would have been equipped with high-altitude climbing gear, food packets and enough oxygen to last 10 days - and the weather was in his favour. But the delay meant the flight was aborted and despite initial plans for a second attempt, it still remains a feat that no one has yet completed. But let's not mention his toilet problem at 26,000ft! An hilarious story shared with everyone on BBC's Have I Got New For You. 2005: Breaks world altitude record for a formal dinner party! Major Tim To Ground Control! Turtle head at 26,000 feet!